(…continued) In Matthew 2:11 we read that the wise men brought expensive gifts to the baby Jesus– gold, frankincense, and myrrh. This is where the tradition of gift giving at Christmas comes from. This giving of gifts gets way over done these days, but the tradition itself goes all the way back to that very first Christmas. Then, right after Christmas, all over the world, another Christmas tradition is carried out; that is, the tradition of returning those Christmas gifts to the store in order to get the cash to get what you really want or need. Did you ever wonder where that tradition got started? I think there is a good chance that that tradition also goes back to the very first Christmas. I think Mary and Joseph probably took that gold, frankincense and myrrh back to the store, (or back to wherever they could), in order to get the cash, which is what they really needed. Think about it. Mary and Joseph did not have much money. We know this from the description of the sacrifice they offered at the temple when they went there after Jesus was born. Luke 2:24 says they offered what the Law required, “a pair of doves or two young pigeons.” That was a poor man’s offering. Those who were not poor were required by Temple Law to offer a more expensive sacrifice, such as a lamb or a calf. But the poor were allowed to get by with a couple of birds. So Mary and Joseph were indeed poor. They were already forced to make the journey to Bethlehem, and then, as now, traveling takes money. There is the expense of being on the road, along with the loss of time at work. Just to get to Bethlehem was probably a financial hardship for Mary and Joseph. Then came the warning to flee to Egypt. This meant more time and expense on the road, more time away from work, uncertain job prospects when they got to the strange land, a new baby to take care of, and no idea of when they would be able to return. It would be like a young couple today, borrowing money for a little weekend getaway to the lake, and then once there, being told they could not go home, but had to fly to Europe and live there for a few years. How would Mary and Joseph have managed the flight to Egypt as refugees? You can’t eat gold, frankincense, or myrrh. They are, to be sure, gifts that bestow a high honor on the one to whom they are given, and that in itself is an important part of the story as a testimony to who Jesus was. He was born to be King of the whole world, even the distant nations, symbolized by the arrival of the wise men from the Far East and their costly gifts. But those gifts were items of luxury for the wealthy only. They had no practical value, and would be of little help to someone who was desperately poor– unless the costly items could be sold, and the money used to buy food and pay for another journey. I do think that Mary and Joseph returned, or perhaps in that setting, sold the gifts at a village market, and used the money to survive their desperate financial difficulties. This is only speculation, of course, but it is a fact that Mary and Joseph were poor. We can be certain of that from the Bible account. This is yet another reason to be amazed at the way God chose to be born into this world– not into wealth or privilege, but into poverty and danger. We can wonder why God allows bad things to happen to us, even when we do not seem to deserve it; but we must admit that when God came to earth in the person of Jesus Christ, he left himself open to the same dangers, troubles, irritations, and disappointments that we all must face. You can randomly open the Gospels to any page, and you will find Jesus in the midst of trouble or disappointment, conflict, or agony. We find this from the very beginning in the difficulties surrounding his birth and first few years. And we most certainly find this at the end of the story, as Jesus is arrested tortured and executed in one of the most painful ways ever devised. And there is trouble for Jesus on every page between the beginning and the end. There are conflicts with religious leaders; there is the unreliability of the crowds, supporting him and then abandoning him; there is the rejection of Jesus by the people in his own hometown; and, there is disloyalty, disappointment and misunderstanding even by those closest to him. The Old Testament prophet Isaiah had foretold that the Messiah would be a “man of sorrows, well acquainted with grief,” and he certainly was. Yes, we also get our share of troubles, sooner or later, or all the time. The sorrows and troubles are not doled out with mathematical precision and equality, but they do come. The old hymn-writer was right when he called this world a “vale of tears.” That is how it is in this world, our home– the only home we know so far. 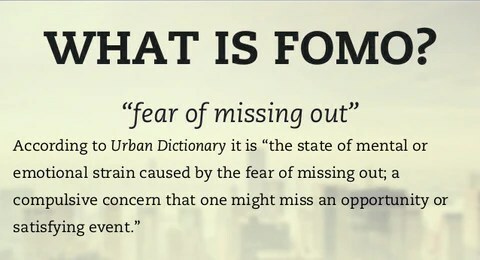 It can also be a wonderful home, but oftentimes it is not. 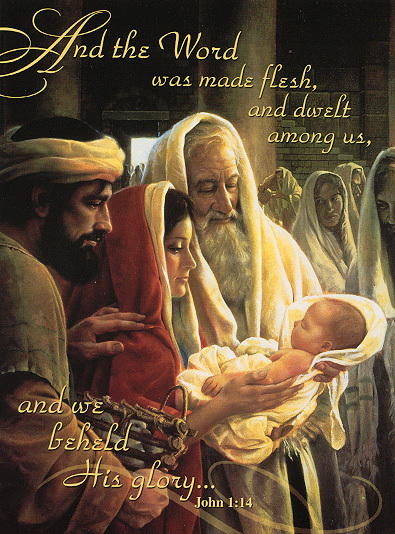 Jesus was born into our world and our home, in order to show us the way to his most perfect heavenly home. Christmas is indeed all about going home. Isaiah 53:3a — He is despised and rejected of men; a man of sorrows, and acquainted with grief. Matthew 2:11 — On coming to the house, (the Magi) saw the child with his mother Mary, and they bowed down and worshiped him. Then they opened their treasures and presented him with gifts of gold, frankincense and myrrh. Grant this, Father, for the love of your Son, who for our sake became poor, Jesus Christ our Lord. Amen. In 1923 Buck Ram, a young, homesick college student, was feeling sad because he would not be able to go home for Christmas that year. Sensing that his mother might also be sad about him not being home, he wrote a little poem to send to her, along with a letter he was writing. Twenty years later, Buck was a successful songwriter and music producer. One evening, he was in a bar with a couple of guys who were also in the music business, Walter Kent and Kim Gannon. Buck told the two men how he had been working on making a song out of this old poem of his, but still wasn’t pleased with the result. He jotted down what he had done with it so far and showed it to them. When they parted, and when Buck wasn’t looking, one of his friends picked up the piece of paper with the poem on it. 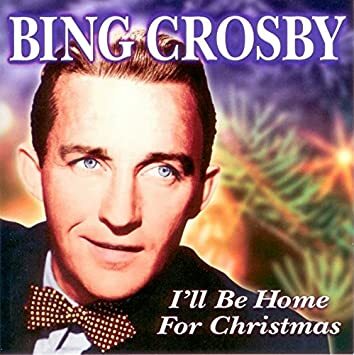 The next year, Kent and Gannon released a song entitled “I’ll Be Home for Christmas,” sung on that first album by Bing Crosby. It was 1943, and with so many soldiers off to war and thinking about home, it became a huge hit. Buck Ram immediately recognized the song as a reworking of his poem that he had shown to the two men the year before. Ram had already copyrighted the poem, so he went to court to sue Kent and Gannon, and won the case. Kent and Gannon then owed Buck Ram some money, but it was then their song. They had, in fact, reworked it considerably, and it went on to become on of the most popular Christmas songs of all time. “I’ll be home for Christmas, tho’ just in memory,” Buck Ram had written. “Only in my dreams…” That is, of course, how it was for many soldiers in 1943, and that is how it has to be for many people for a variety of reasons. Here in Minnesota, the weather sometimes keeps families from getting together for Christmas. That is then for many people a big disappointment, because being home for Christmas is indeed such a huge holiday tradition. For many families, with members living all over the country, Christmas is the only time they get together. Making the trip can be a challenge for a whole family to schedule, a huge expense for those flying, and a significant hassle to make it all work, even when the weather is fine. For most people, the trip is well worth it. It is important to maintain those family ties and connections, and that cannot be done without occasional visits and traditions– and being together at home for Christmas is one of the best-loved family traditions. It is worth noting that this season, which has become the one time of year that people really try to go home, began with the story of a young family that was a long ways from home. The story of the first Christmas begins with the story of a journey, a journey away from home, which for Mary and Joseph was Nazareth, to Bethlehem, where Joseph was required to register with the Roman government for a census. Bethlehem was seventy miles from Nazareth, they would have to walk, and Mary was almost ready to give birth. It was not a good time for a journey and not a good time to be away from the comfort and the support of home. To make matters even worse, when the registration was done, and after the baby had been born, Mary and Joseph were still not able to go home for a very long time. Matthew’s Gospel tells the story of the wise men, who meant well, but unknowingly put the new baby’s life in danger by telling King Herod about the birth of this new King. After the wise men leave the holy family, Joseph was warned in a dream to take his family to Egypt and hide there for a while because King Herod would be trying to kill Jesus. Then Matthew tells us of Herod’s wicked decree that all the baby boys in Bethlehem under the age of two were to be killed. 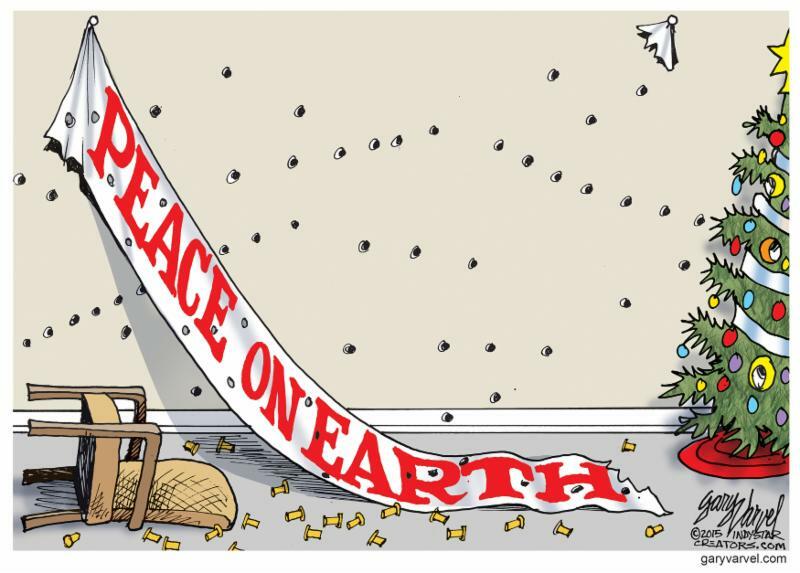 Think of the grief that caused for those many families in Bethlehem! Luke 2:1…3-5 — In those days Caesar Augustus issued a decree that a census should be taken of the entire Roman world. And everyone went to their own town to register. So Joseph also went up from the town of Nazareth in Galilee to Judea, to Bethlehem, the town of David, because he belonged to the house and line of David. He went there to register with Mary, who was pledged to be married to him and was expecting a child. Matthew 2:13-15a — When they had gone, an angel of the Lord appeared to Joseph in a dream. “Get up,” he said, “take the child and his mother and escape to Egypt. Stay there until I tell you, for Herod is going to search for the child to kill him.” So he got up, took the child and his mother during the night and left for Egypt, where he stayed until the death of Herod. Lord, we pray for our own families at Christmas time; for those who will be with us, and for those who will be far away; for those too young to understand all the excitement, and for those who feel sad because of memories of those who are no longer with us. Help us to be patient with one another, and show us how we can put the love of Jesus at the heart of Christmas. Amen. By Al Rogness, The Word for Every Day, Augsburg, 1981, page 359. 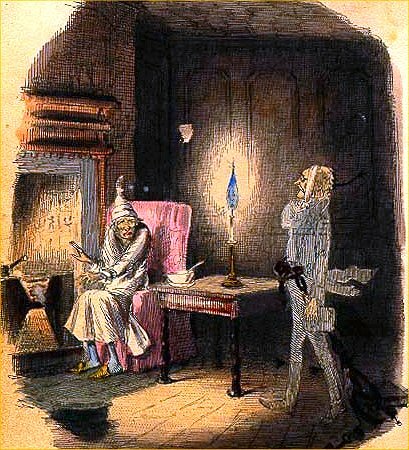 No Christmas seems complete for me without hearing again the great message of the Lord’s redemption in Handel’s Messiah and in reading the story of a man’s transformation in Dicken’s character, Scrooge. For over 200 years since its premier in Dublin, the Messiah has inspired audiences the world over. Opening with the tenor recitative from Isaiah, “Comfort ye, comfort ye, My people, saith your God,” and rising to the heights in the “Hallelujah Chorus,” and closing with its thrilling lines, “Worthy is the Lamb that was slain,” it joins a remarkable selection of Scripture with an inspired musical score to usher the listener, or worshiper, into the vestibule of heaven. From Ireland it moved to England where in 1759, at Covent Garden, Handel, then nearly blind, made his last public appearance, dying eight days later on the eve of Easter Sunday. From England it went to Germany, where at one performance there were a thousand singers and instrumentalists. Parts of the oratorio were first sung in the United States in a New York tavern in 1770. Next to the incomparable story in Luke 2, these two pieces, the Messiah and The Christmas Carol, set the tone for my Christmas. They can for yours, too. Luke 2:1-7 — And it came to pass in those days, that there went out a decree from Caesar Augustus that all the world should be taxed. (And this taxing was first made when Cyrenius was governor of Syria.) And all went to be taxed, every one into his own city. And Joseph also went up from Galilee, out of the city of Nazareth, into Judea, unto the city of David, which is called Bethlehem; (because he was of the house and lineage of David:), to be taxed with Mary his espoused wife, being great with child.